Ottolenghi says, “Roasting a chicken is the ultimate simple dish.” I agree, and enjoy cooking and eating this. 1 lemon: finely zest to get 1 tsp., then juice to get 1½ Tbsp. Place the butter, thyme, garlic, preserved lemon, lemon zest, ¼ tsp. salt, and a generous grind of pepper in a food processor. Blitz to combine. With the chicken’s legs pointing toward you, use your hands to loosen the skin away from the breasts and spread most of the butter mixture evenly under the skin and over the breasts. Spread the remaining butter over the legs. Place the chicken in a medium high-sided baking pan, drizzle with the lemon juice, and sprinkle with ½ tsp. salt and plenty of pepper. Roast for roughly 70 minutes, basting every 20 minutes or so, until the skin is golden brown and crisp and the juices run clear when the meat is pierced with a small knife. Remove from the oven and set aside to rest for 10 minutes before serving. This exercise is totally hands-on. After blending the buttery rub in my food processor, I smeared it under and over the chicken’s skin, without caring much about finesse. 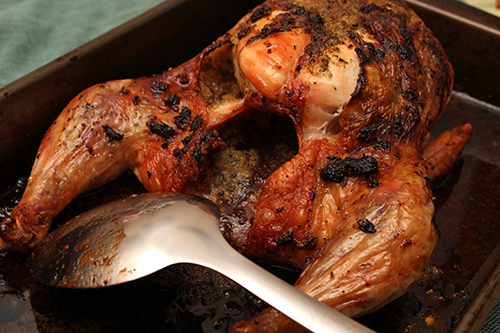 The chicken then cooks itself, at a high-temp roast, and comes out crispy and lemony. Next week, I’ll showcase a fine side dish for this chicken: the “Pea, Za’atar, and Feta Fritters,” from Ottolenghi Simple. Come back to see how it happens. Pulse the defrosted peas in a food processor just until they are coarsely crushed, then transfer to a mixing bowl. Stir in the ricotta, eggs, lemon zest, the salt and a good grind of pepper, then add the za’atar, flour and baking powder, mixing until they are just incorporated. Gently fold in the mint and feta; you don’t want the chunks of cheese to break up. Heat the oil in a medium saucepan over medium heat. Line a plate with paper towels. Divide the mixture into 8 equal portions, shaping them into balls, patties or quenelles that are about 1½ inches wide. Cook about 4 at a time for 3 to 4 minutes, turning them to brown evenly. Use a slotted spoon to transfer them to the lined plate while you cook the remaining batch. Serve warm, with lemon wedges.